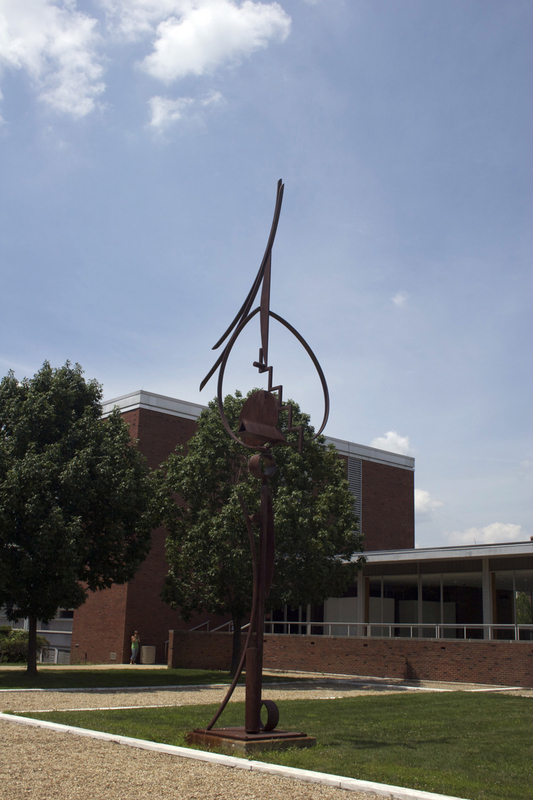 This steel sculpture was created by Benton, Fletcher. 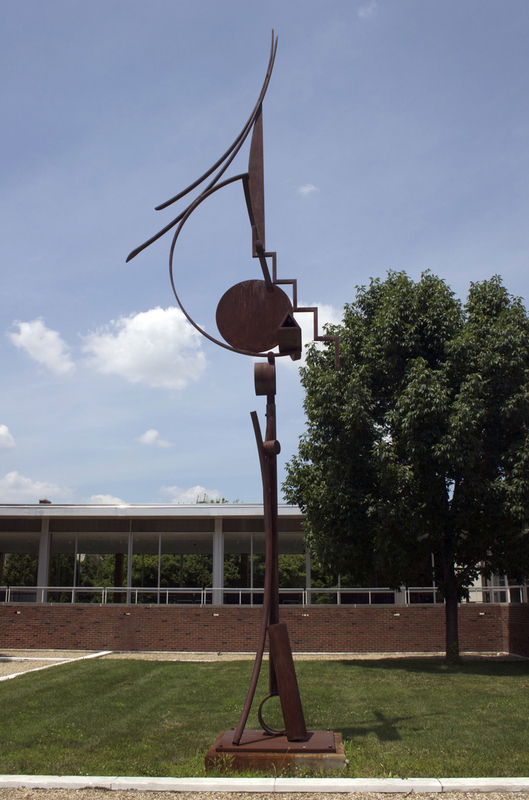 It was installed in 1998 and is displayed at Krannert Art Museum. Born in 1931 in Jackson, Ohio, Fletcher Benton relocated to San Francisco after graduating from Miami University in 1956. In 1966 Fletcher started teaching at the San Francisco Art Institute and established himself as a primary figure in American kinetic art. He later focused on a style that became known as new constructivism, characterized by its reliance upon abstract form, color, line, texture, and shape (Neubert 2001). In the early 1980s, Benton launched a series of works called Steel Watercolors. According to Benton, "you’ll see that there’s not too much that is defying gravity in an illogical way, where I’m counting on the strength of the weld to be ridiculous about the positioning of the geometry" (Benton 1989). Some of the Steel Watercolors are painted, such as China Moon (Benton, 1990), while others, such as China Moon II, are not. China Moon II exemplifies Benton's interest in line from this period, containing several curved, straight, and zig-zagging shapes of varying volume. Views are encouraged to move around the scuplture and examine its shape from every angle. 500 E Peabody Dr, Champaign, IL. ~ This work can be viewed at the south entrance to the Krannert Museum. Benton, F. (1990). China Moon. Benton, F. (May 2-4 1989). Interviewed by P.J. Karlstrom (sound cassette). Archives of American Art, Smithsonian Institution. Washington, D.C.
Carter, R. (2008). Fletcher Benton: the Purpose of Harmony. In B. Fletcher, Fletcher Benton: an American Artist (1st ed., pp. 7-9). Manchester: Hudson Hills Press. Sarah Christensen, “China Moon II,” ExploreCU, accessed April 21, 2019, https://explorecu.org/items/show/66.